First a big thanks to Char for giving other artist the opportunity to be a guest writer. Thanks Char! 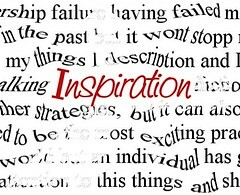 In this article I’m going to talk about inspiration. It’s funny, because a while ago someone asked me what exactly inspired me to draw or to keep drawing. It got me thinking, because drawing has always been a part of my life, so I never really considered the ‘why’ part. Drawing is something that runs in both sides of my family. So this got me also wondering, because having the talent running in the family doesn't automatically mean that you will inherit the ability to draw. Why do I draw? I've always been interested in creating things on paper. Armed with a piece of paper and a pencil, I started doodling stuff. Most of it was probably unrecognizable from my surroundings, but they told a story in my mind. I think when you are younger you are carefree, you see the fun in everything you do and you tend to draw spontaneous and carefree. As you get older you get more responsibilities and you tend to make things more difficult than they really are. I think this can eventually block the inspiration flow for a lot of people. What keeps me inspired? Inspiration is a big word and has many layers. What inspires me doesn’t have to be inspiring to others. For me, inspiration can be found in the smallest and plainest things in life. Maybe you see dust twirling in a sun beam and it sparks a feeling, an image or an idea. I can't really explain how it goes, but it feels like it sparks forgotten memories or maybe even memories that haven't been created yet. And it's not that these memories suddenly flash before my eyes, but what I eventually grasp is this feeling that will be translated in a drawing or story piece. It's quite difficult to put it in words though, but I hope you understand what I mean! Also, just talking to people, hearing others talk or watching other artists draw, can inspire me to draw new things. Sometimes just one word in a conversation can spark a whole new drawing. There are so many interesting things in the world that I often find myself just daydreaming and creating new worlds in my mind. So I try to capture all this in words or quick sketches and I will work on them in a later stage. The same goes for music or reading books or magazines. The way songs are composed or sentences are constructed can be an inspiration for new drawings. What I often forget that getting inspired also works the other way around. I often hear from others that I inspire them to pick up brushes again or do something new and I’m truly grateful for this. Have to say that I never considered this at all, but it makes sense. By being inspired by others, you improve your own skills and you inspire others to get better as well. It’s a vicious circle, but I often get stuck at the part where I only get inspired by others! Finally, just one tip: Don’t get scared or too annoyed when you get an ‘artist block’. It’s only normal to have them and it usually happens when you start to over think things and are trying too hard. Well in my case anyway haha. Just let it go, focus on other things and it should get better. Thanks for reading and feel free to share your stories as well. TJ Lubrano is a freelance illustrator from The Netherlands. She's self taught works mostly with watercolours & ink. Drawing has always been a passion of hers and most of the time she is to be found in her own imaginative world. To get to know more about her, just visit her site A Look in a Creative Mind. TJ can also be found on Facebook and Twitter under the name TJ Lubrano.